We set off from Chamje (1430m) after breakfast with our new friends, but quickly, they outpaced us (helps that they had porters!) 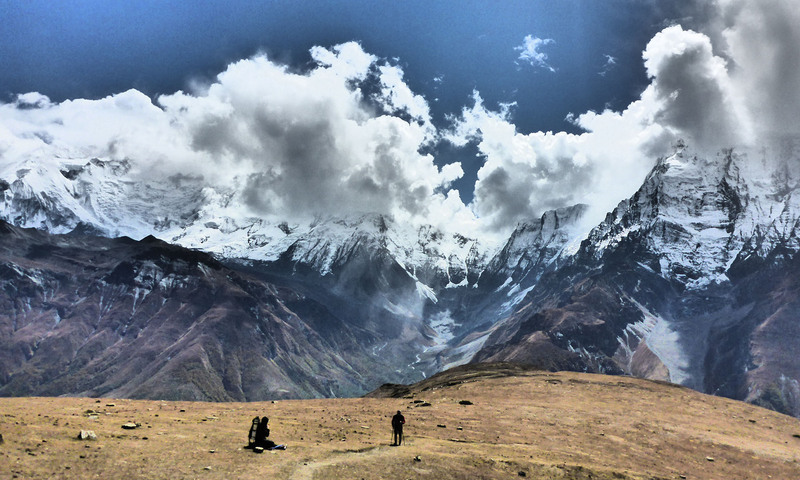 and then we took “the scenic route” from the fancy guide book Rick got ([amazon text=Trekking the Annapurna Circuit&asin=B00F1X3LQ6]). In my estimation, it was just on the other side of the river and had massive ups and downs, while the road was a steady climb and faster. So we lost our friends. The waterfalls were crazy incredible though. It was so much more lush than I dreamed!! And gorgeous flowers everywhere – like all of the ones you see at the florist just growing everywhere – zinnias, gladiolus and a bunch I can’t remember the names of! And the most beautiful butterflies ever! We are hiking along side the river at least every day so far. Not because it’s pretty, but because it’s the only way you can get around the enormous mountains. The mountains are so different here. They are so straight up, so steep, so sharp. 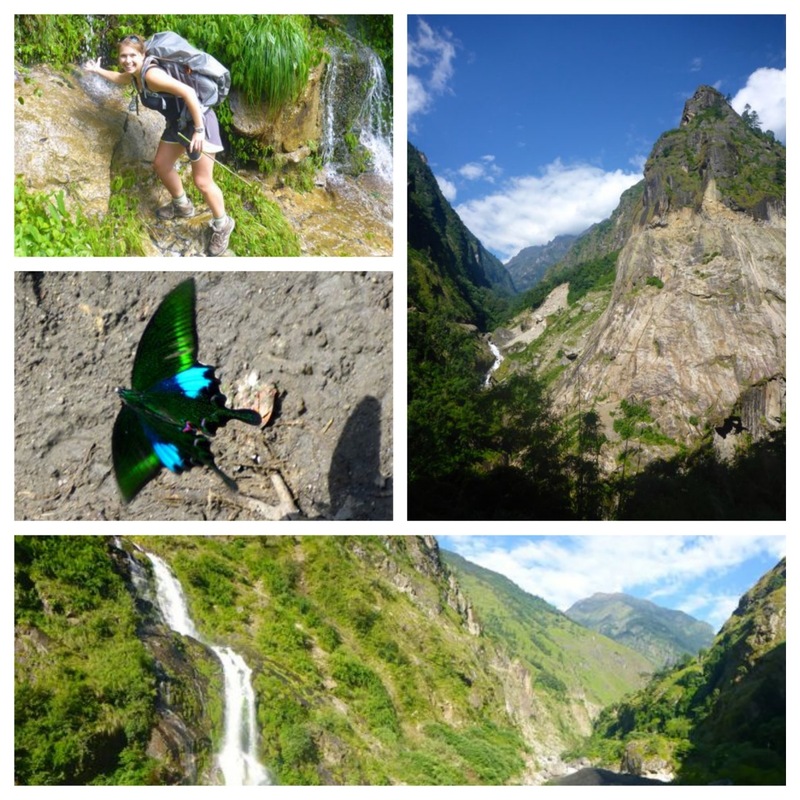 This days hike was incredible with the lush forest and waterfalls, but it was a LONG day and bit of a beating. We happily ran into our friends later that afternoon when we stopped for the day in Danakyu (2300m), and found the BEST guest house yet!!! I think we were the first people to stay in our room – they are amazing craftsmen here. All hand made out of wood and perfectly cut. The room smell of fresh pine and I could’ve sworn the mattresses were Tempurpedic!! At least compared to previous. 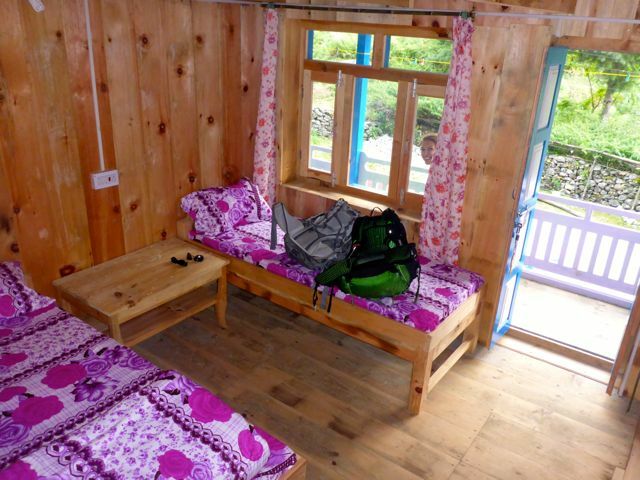 If you’re ever in the neighborhood we highly suggest the New Manaslu Hotel! 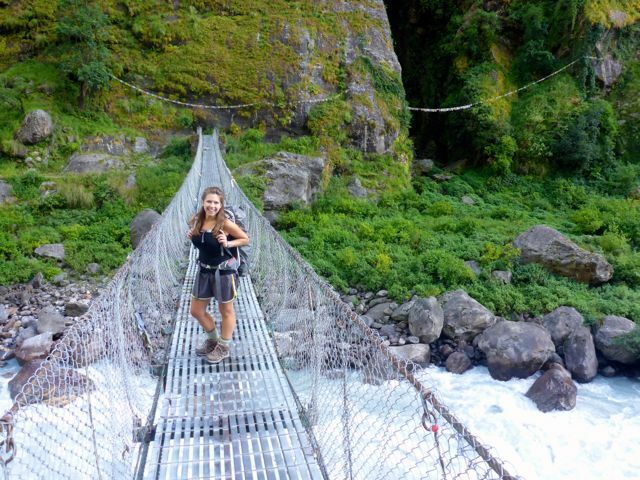 We got our first view of some BIG mountains not the ones we’re hiking, but the Manaslu Range and it was incredible! The mountains are so big they look like clouds! And my highlight of the day was being allowed to sit in the kitchen next to the fire while our hosts cooked dinner and chat with Leonie and Maryse! 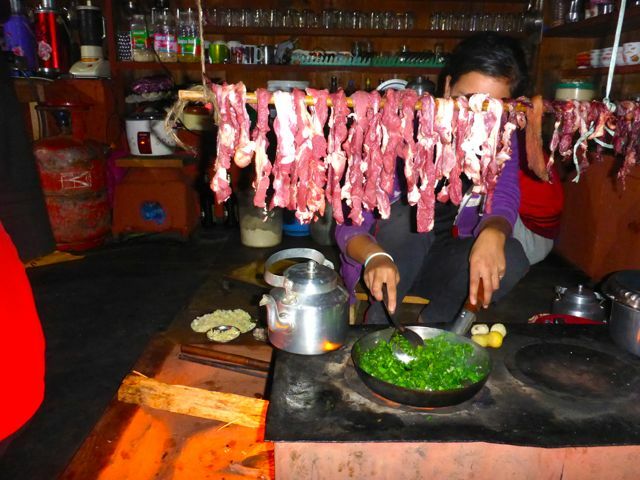 In Nepal the kitchen is a private place, you don’t let guests in there, you don’t hang out in there – the best comparison I can think of is like our master bathrooms, kinda. 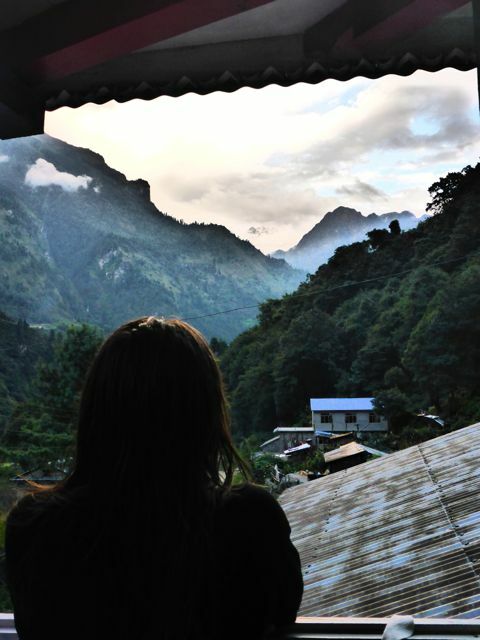 So anyway, we felt so privileged to get to sit and enjoy our Nepali hosts. Yes… That is fresh goat meat curing over the wood stove. We ordered dinner and got to watch them make it… From scratch. And from scratch has a different meaning here! We ordered Vegetable Momo – these delicious little dumplings they have here. As soon as we ordered one of the girls goes out to their garden and harvests a bunch of spinach and onion and garlic. And then they start making the dough. It’s an hour and half process. Every step so intricate and so cared about! Folding the Momos is such an art. I couldn’t stop watching and they laughed at me. But they are truly individual pieces of art. And of course tasted delicious! What beautiful photos! And your commentary helped me share this amazing experience – thanks for the update. Wishing you many more fantastic discoveries ahead! That butterfly is legit. Love the updates!! Looks like you all are having a fantastic time. Are you still going up hill? Hope the Wx. is holding up for youall. How many miles a day are you doing. Love you be Carefull.